The Eleaf iStick Trim is a clear winner in the looks department, as it not only features an attractive exterior, but is one of the best starter kits out right now. The main design hasn’t changed much from the first iStick from Eleaf, but many meticulous improvements have added much depth to the ergonomics of the iStick Trim. The Eleaf iStick Trim flaunts a smooth metallic texture and comes in complementing colors; black, silver, rose gold and green. The polished metallic chrome feel, at the top and bottom part of the mod, looks absolutely stunning. The body has a texture of anodized steel and the color sits graciously on the body. The color of the iStick Trim series is very subtle and is not designed as an eye-catcher. The device measures 35mm x 15mm x 73mm and is easily pocketable. The name “Trim” comes from the 15-mm width, which makes it very easy to slide down into your jeans pockets. The device is very convenient to hold, as it is not too small to lose grip and not too big to lose stealth. The Eleaf iStick Trim carries a 510-pin, that is not spring loaded, so you can’t experiment with other tanks. The fire button is placed on one of the sides, just beneath the tank-hole. There is a small screen, that highlights one of the three power modes while the device is turned on. You also get a battery indicator with five bars on this screen. The micro-USB charging port is also fixed at the top, on the metal outline. It has got good build-quality and fixes with the cable quite firmly. The Eleaf iStick Trim comes with a GS Turbo Tank, that is made of high-grade stainless steel and Pyrex glass. The GS Turbo Tank is very easy to load, clean and re-wick. Overall, the simplicity of design is something to cherish in this latest Eleaf creation. What are the contents of the Eleaf iStick Trim? The Eleaf iStick Trim comes in a nice cardboard box that contains two compartments. The outside box contains the “scratch and check” sticker, which is an authenticity check against duplicate products. The kit contains the following items. The Eleaf iStick Trim is a niche device, designed for light-vapers and people new to vaping. The Eleaf iStick Trim can be a perfect device for someone who has just left smoking, as it can be used both for mouth-to-lung vaping and direct-lung hits. Operating in a resistance range of 0.6-1 ohm, you can get the best out of your e-juice. The mod packs a powerful punch to your e-liquid and can reach 25W of maximum wattage. This power does decrease with use, so consistency in vapor quality is an issue. You will experience dense and flavorful hits for the first 20-30 puffs, after which there is a noticeable degradation to both the density and flavor quality of the vapor. The GS Turbo Tanks adds a whole new dash of life to the vapor quality and you can vary the air-flow to five different levels. However, the airflow holes are controlled by a rubber band gasket, which makes it a little too hard to rotate. How to operate the Eleaf iStick Trim? Operating the Eleaf iStick Trim is plain and simple. You have three power modes to work with; low, medium and high. The markings are done at the top of the mod, beside the tank-port. Five clicks on the fire button will start the device, while three quick clicks will rotate the mod between the three power settings. What is the review of the coil head that comes with the Eleaf iStick Trim? The Eleaf iStick Trim comes with three coil heads. The 1.5-ohm coil head is fixed inside the device while the other coils, which have a resistance of 0.75 ohms, are packed as spare. The coils have symmetrical vacuum ports, with the cotton wrapped to the chimney. The build quality is nice, and it gently vaporizes your e-liquid. The Eleaf iStick Trim is a thoughtful product from Eleaf. It improves many aspects of the original iStick mod and does give you a good value for money. It not only looks and feels elegant, but it is also very easy to use. The tank can be disintegrated easily for cleaning and re-wicking purposes. The instruction manual, written in English, is easy to understand and a perfect place to start for people new to vaping. However, there are some limitations to this device. The vapor quality is not too strong but good enough for someone new to vaping. The 1800 mAh battery isn’t big enough to last you through the day and neither is the battery interchangeable. This can be a concern if this is the only mod in the house. So, we suggest this mod as a backup mod or for casual vaping needs. This is also a great choice for beginners. We give this mod 8 out for 10. The Eleaf iJustX All-In-One is a run-of-the-mill vaping device that won’t burn a hole in your pocket. With 7ml tank and 3000 mAh battery, this review is apt for heavy vapers. 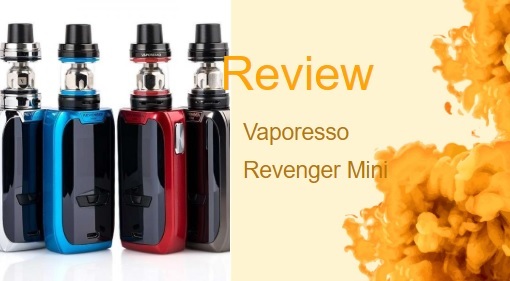 The Vaporesso Revenger Mini is a compact but powerful mod that is sturdy enough for transportation, and still has a cool aesthetic that friends will envy.